Lavish yourself with this bed designed for those looking for a glamorous upgrade of your most private and personal space in your home. 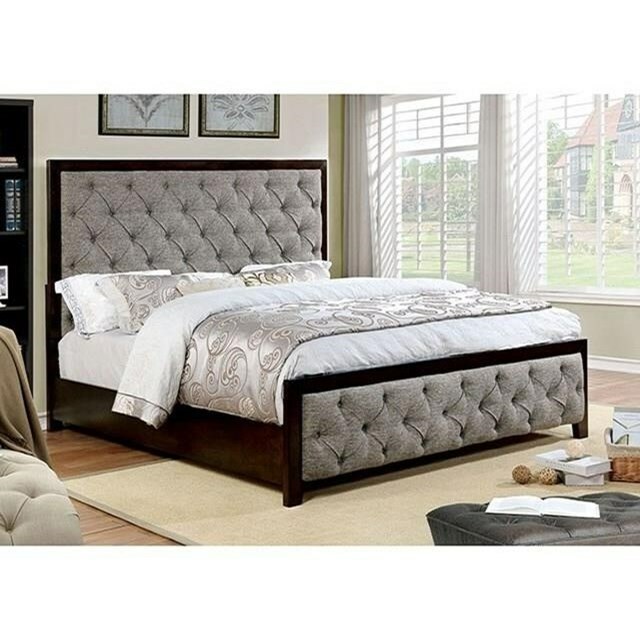 A style uniquely designed to match the upscale luxury of an elegant home, this contemporary set comes complete with a padded fabric headboard and footboard for the utmost elegance in design and comfort. The button tufted feature highlights the solid wood frame and the warm gray tone goes well with the walnut finish. The Asterion Transitional California King Upholstered Bed with Tufting by Furniture of America at Del Sol Furniture in the Phoenix, Glendale, Tempe, Scottsdale, Avondale, Peoria, Goodyear, Litchfield, Arizona area. Product availability may vary. Contact us for the most current availability on this product. CM7156CK-HB Headboard Component 1 0" 0" 0"
CM7156CK-FB Footboard Component 1 0" 0" 0"
CM7156CK-R Cal King Rails 1 0" 0" 0"
Browse other items in the Asterion collection from Del Sol Furniture in the Phoenix, Glendale, Tempe, Scottsdale, Avondale, Peoria, Goodyear, Litchfield, Arizona area.